Rita Fest, the daughter of William and Mary (Jackson) Bickner, was born on January 29, 1932 in Emerald Township, St. Croix County, near Cylon, WI. As she grew up her family lived near Cylon, WI, New Richmond, WI, Worthington, MN, Hudson, WI and in Heron Lake, MN. She graduated from the Heron Lake High School in 1949. Rita was united in marriage to Donald Fest on August 28, 1951at Sacred Heart Catholic Church in Heron Lake. After their marriage they lived on a farm near Heron Lake for 62 years. 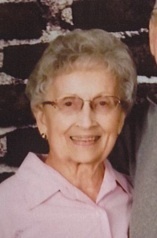 Rita moved to the Maple View Estates in Fulda after Don passed away in May of 2013. Rita entered the Maple Lawn Nursing Home in July of 2015 and passed away there on Monday, March 18, 2019 at the age of 87. She was a member of the Sacred Heart Catholic Church in Heron Lake where she belonged to the Sacred Heart C.C.W. and taught Sunday school. Rita was a member of the Fraternal Order of Foresters. She also did volunteer work at the Heron Lake Nursing Home. Rita enjoyed bowling, sewing and spending time with her family. Survivors include her 3 children, Deb (Dan) Isaacson of Jackson, MN, Mike (Jane) Fest of Heron Lake, MN and Ann (Jim) WItzel of Fulda, MN; 13 grandchildren; 22 great-grandchildren; 2 brothers, Bill Bickner of Stillwater, MN and Tom (Linda) Bickner of Hastings, MN and sister-in-law, Darlene York of Alamos, NM. She is preceded in death by her parents, sister, Ardis Turnbull and husband, Don. St. Francis Xavier Catholic Church Windom, MN at 11:00 AM on Friday, March 22, 2019 with Fr. Pratap celebrating. The organist is Colleen Ortmann. The song leader is Nadine Forman. The pallbearers are Travis Hendel, Levi Fest, Matt Witzel, Andy Witzel, Chris Witzel, Tim Schmidt and Steve Schmidt. Honorary pallbearers are Stephanie Sparks, Sandra Milton, Elizabeth Janssen, Cassie Fest, Margret Witzel and Jen Collin. Interment at Sacred Heart Catholic Cemetery Heron Lake, MN. Visitation will be two hours prior to the service at the church on Friday. In lieu of flowers the family requests that donations be made to the Alzheimer’s Association. The Totzke Funeral Home in Fulda is assisting the family with arrangements.